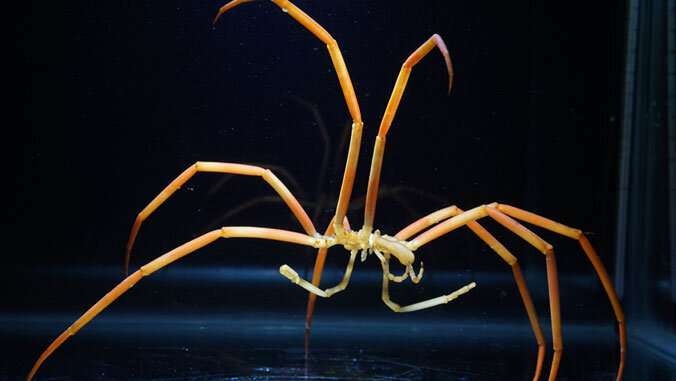 Giant sea spider, Colossendeis robusta, used in the thermal tolerance righting assays inexperiments done by Shishido and colleagues at McMurdo Station, Antarctica. Credit: Photo by Tim Dwyer, ARCUS. Scientists have wondered for decades why marine animals that live in the polar oceans and the deep sea can reach giant sizes there, but nowhere else. University of Hawai'i at Manoa zoology Ph.D. student Caitlin Shishido, with UH researcher Amy Moran and colleagues at the University of Montana, went to Antarctica to test the prevailing theory-the 'oxygen-temperature hypothesis'-that animals living in extreme cold can grow to giant sizes because their metabolisms are very slow. The animals they studied were sea spiders, marine relatives of land spiders that breathe through their legs. The study, published in the April 10 issue of Proceedings of the Royal Society B, was performed at McMurdo Station, Antarctica, and at UH. "The idea is, it's a lot of work for animals to capture oxygen and bring it all the way to their cells," said Shishido. "It's a much bigger job for large animals than for small ones. If cold temperatures make you need less oxygen, you can grow to a larger size." To test whether giant spiders were more affected by warming than small ones, the researchers exercised the spiders to exhaustion by flipping them upside-down and counting the number of times they were able to right themselves at a range of temperatures, from their normal -1.8°C all the way up to 9°C. Counter to predictions, giant animals kept up with smaller ones at every temperature. "We were amazed that not only could the giant animals survive at much higher temperatures than they usually see, but they dealt with warm temperatures just like the smaller ones," Shishido said. "That's not supposed to happen; larger animals should exhaust their oxygen supply and run out of gas much sooner than small ones." This should be especially true for sea spiders, which are 'skin breathers' - they have no gills or lungs to help get oxygen, but have to rely on diffusion across the surfaces of their legs. 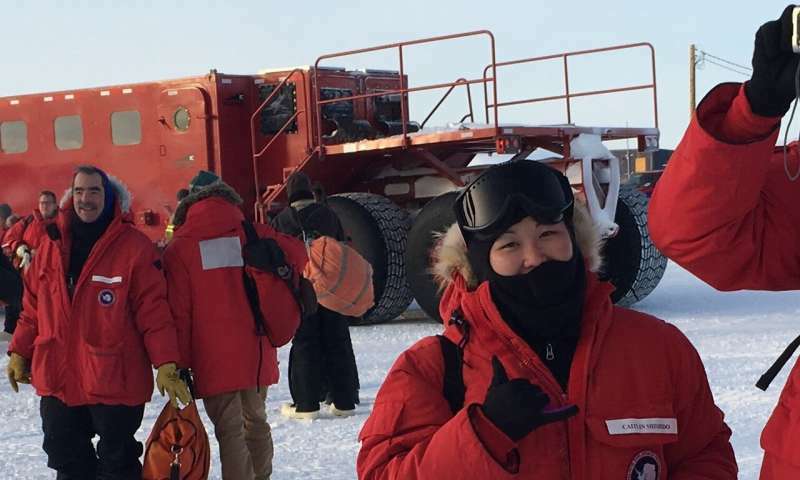 Lead study author Caitlin Shishido, Ph.D.candidate in Zoology at UH, arriving at McMurdo Station, Antarctica in 2016. Credit: Amy Moran. How do giant sea spiders appear to get around the laws of physics? This was a mystery, until Shishido and Aaron Toh, a UH undergraduate student, used microscopes to look closely at their legs. The legs of sea spiders are covered with pores, and the researchers found that as the sea spiders grow, their exoskeletons become more and more porous. "The exoskeletons of the really big ones look almost like Swiss cheese," said Shishido. The researchers cautioned that these were short-term experiments and the long-term effects of warming on giant animals are not yet understood. However, it appears that, thanks to their holey cuticles, these giant polar animals may not be as vulnerable to warming oceans as previously thought.